Early on in my paleo journey, I figured out that leftovers were the key to easy lunches. It generally doesn’t take me any longer to cook a couple extra chicken breasts, burgers or pork chops. Even if it’s a larger roast, I usually throw it in the crockpot and it’s even easier. Leftover shredded beef (or even a pot roast) becomes a DIY Chipotle bowl on a bed of lettuce. Topped with diced tomato, avocado and a lot of my favorite paleo-friendly hot sauce, I don’t mind so much that it’s an hour to my nearest fix. Leftover chicken breast, chopped up with a little onion, celery, grapes and some seasoning makes a great chicken salad. I mixed this one up with a tiny bit of olive oil mayonnaise. 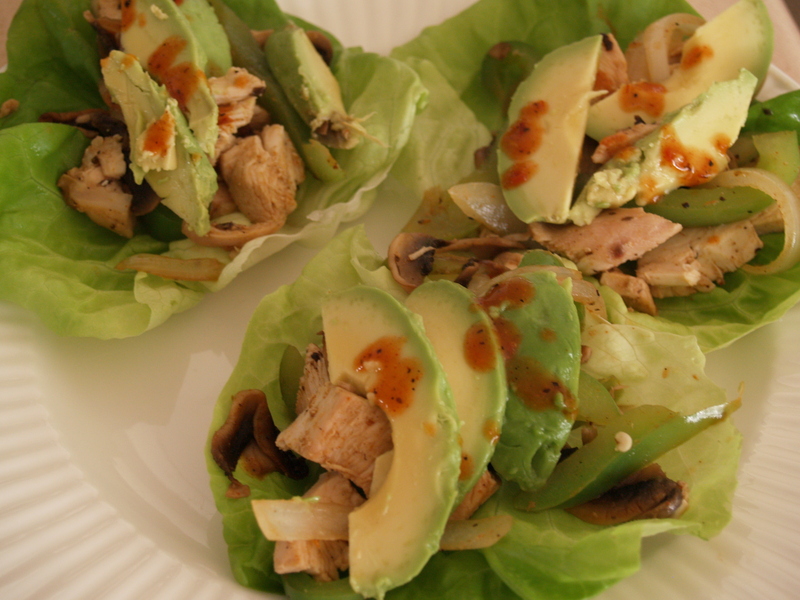 Perfect in a lettuce wrap or on top of an avocado. Yes, I really like avocado. Leftover any-sort-of-meat, sauteed quickly with chili powder, cumin, onions and bell peppers make a quick fajita lettuce wrap. Especially good topped with more avocado. And a side note: any leftover meat in a lettuce wrap is an easy-as-can-be lunch. Good grief, do I really eat that much avocado? 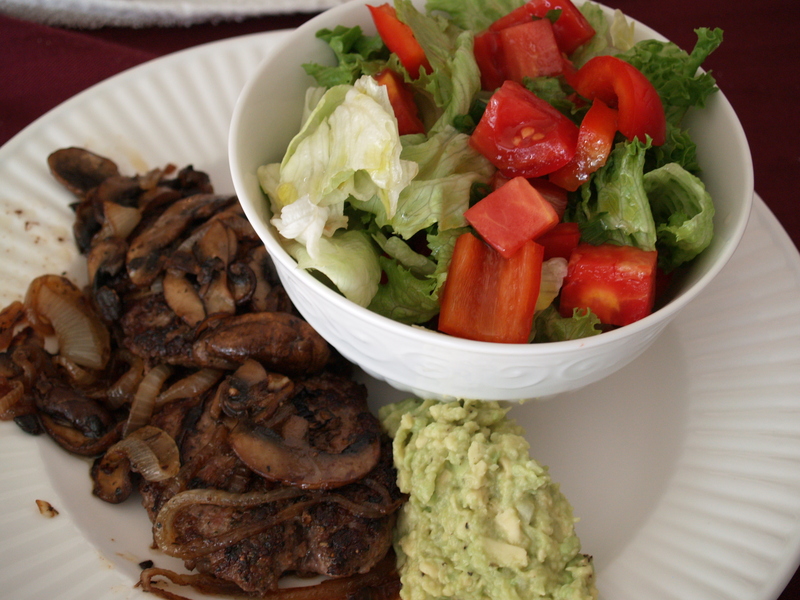 Leftover grass fed hamburgers from one night, leftover onions and mushrooms with a bonus salad from another. It always pays to cook extra. Easy peasy, one pan – slice up a leftover apple chicken sausage and reheat in the frying pan. Remove from the pan and scramble a couple of eggs. 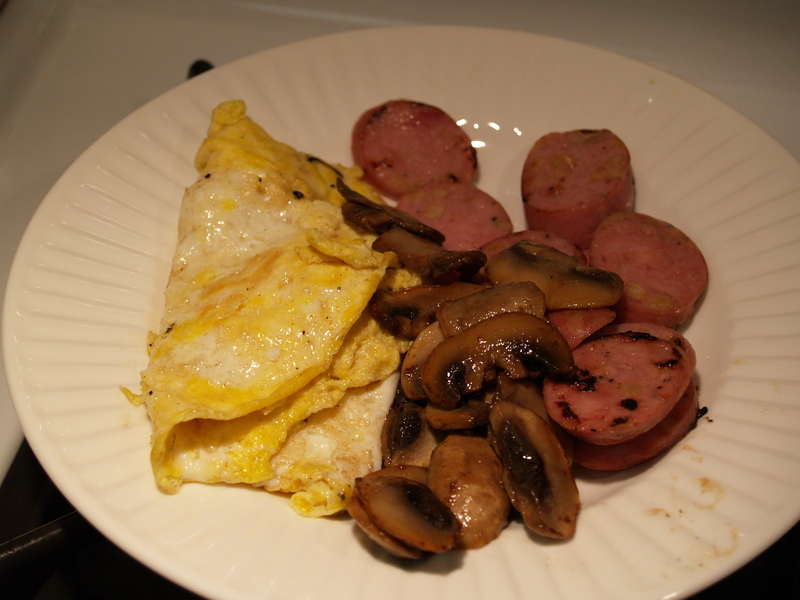 Remove from the pan and reheat leftover mushrooms. And in case you’re wondering…I usually go through 3 or 4 avocados a week on my own. I get lots of compliments on how shiny my hair is. This entry was posted in Five for Friday, Simply Paleo and tagged leftovers, paleo lunches, primal lunches by Awkward Girl Gets Fit. Bookmark the permalink.